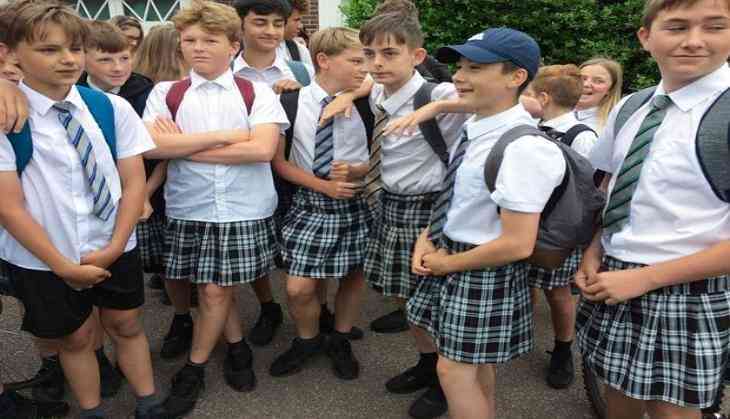 Teenage boys from a school in England's Exeter City adopted a unique way to protest as they arrived at school wearing skirts instead of trousers. More than 30 students at Isca Academy donned skirts to protest against wearing trousers despite the increase in temperature. When the Academy opened on 22 June, students protested bare legged at the secondary school in England. As the temperature increased in Exeter city, the male students of the academy asked their teacher if they can wear shorts instead of trousers. But they were denied to do so. When they asked why girls are allowed to go bare legs. The teacher jokingly said you are free to wear a skirt too if you choose. Some of the students had rented the skirts, while other had obtained the skirt from their girlfriend and sisters. The entire protest began when a teenage boy Ryan came up with the thought to wear the skirt. So he borrowed one and wore it on 21 June along with 5 of his friends. Then the next morning more boys joined Ryan and his friends. To avoid the beauty police, some of the boys even visited a shop on their way to Isca to pick up razors.